So, I tend to get a little obsessive when I find something that I like. For instance, in college I called every snowboarding shop in the LA Basin looking for pants to match my snowboarding jacket. The only shop that had them was in Manhattan Beach, and at that time I lived in Westwood. It was 5:30pm on a worknight, and I decided that I had to drive to Manhattan Beach right that second to make sure that I got the pants. Note---I didn't know how to get to Manhattan Beach except by going down the 1. So that's what I did. It took 2 hours, but I got the last pair in the county. SUCCESS!!! Now, I've become obsessed with the BOB Strollers. 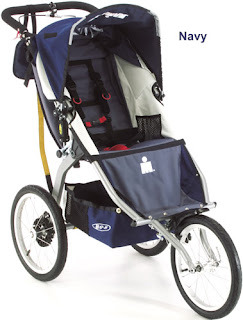 It's the olympic champion of running strollers, and I have heard nothing but amazing things about it. (Side note: I can't believe that I'm obsessed with a stroller). It can go off-roading. It glides like Kristi Yamaguchi on ice (or DWTS stage). I can pick it up with no problem, where as I struggle with carrying any other stroller, although I am working on arm weight training. And, from what I hear, it will be a comfy ride for little one. However, paying $250-400 for a stroller is ridiculous! What this obsession means is that I spend lots of time searching Craigslist in every area where someone I love lives-northern and southern california, portland etc. for a cheap version; looking at REI for the next dent n' ding sale; and second hand stores. I WILL FIND IT :) and I will find it for less than it's retail amount. Just you wait! My daughter has now turned into my wife. Yicks, another person with a "obsession driven personality." Try "Kids 2 Teens" in Simi Valley. They have new and consignment (sic) items at good prices. They may have your "stoller" there. I love BOB! I know why you are obsessed...they are the best out there for sure!! But think about getting one with a revolving front wheel. We have the revolution and love it! Because the front wheel has the capability of rotating or it can be locked in place, it is much more versatile. We use it for everything, from walking downtown, to hiking, to exercising/running/rollerblading. I have used my friends that doesn't turn at all and it is difficult to walk with because you always have to lift the front up to turn...If you still really want the ironman, I will keep my ears and eyes peeled!! :) ah...all the things you need...so much fun!